Caring for baby chicks is fairly easy. The key is keeping them warm and safe, with a steady supply of fresh water and food. Start up cost, including the birds, is under $50! Sure, buying the fancy waterer and food dispenser is convenient, and a plastic bin may be a little easier to clean up, but they are not necessary. Below is a photo of our set up this year. We use a purchased waterer, as we have to refill it less, but you can also use a shallow bowl filled with marbles (to prevent drowning), and a cut off an instant soup bowl for food (couldn't find our chick feeder!). We set the water on a salad plate to prevent chips from getting into and soaking up the water. We've always just used a cardboard box, but a plastic tote, or even an old galvanized water trough works! You'll want about 1/2" or so deep layer of pine chips in the bottom for bedding. Keep the box away from drafts. As you can see, we secure the heat lamp to a dining room chair. You will want the temperature inside the box somewhere between 85 and 95 degrees for the first week or so. If they congregate directly under the lamp, and refuse to leave the huddle for food or water, it may be a little too chilly for them. Adversely, if they are as far as possible from the heat source and panting, raise the lamp. Put the food and water a little ways from the lamp to encourage movement. Personally, we put powdered antibiotic in the water for the first week we have them, to address any illness they mave have gotten from other chicks, or during the stress of travel. After the first week, and for the rest of their lives, they will only be treated with medicated water in the case of illness, never as a preventative measure. Nor will they be fed any sort of medicated feed! If you want your adult chickens to be friendly, handling them gently several times a day is the key. My adult birds come when called, many seek out human attention on their own, and the majority can be carried around without any complaints (with a few exceptions, roosters and dominant hens are less likely cooperate...) by doing so. Be exceptionally vigilant around small children and cats or dogs who are not familiar with baby chicks when handling them. Lil Raisin Acres' 2 Year Anniversary! Over the weekend (Friday 2/20), we celebrated our 2nd Year Anniversary here at Lil Raisin Acres! We've learned quite a lot over the past couple years, and although we've made a lot of improvements, there are still many more on the wish list! It was certainly a LOOOONG time coming! We had been dreaming of downsizing, moving away from the city, living a slower paced, more self-sufficient lifestyle with a large garden and some backyard chickens for several years before we got here. But, nothing worth having comes too easily, I guess! We had been looking around at property for quite a while back in the fall of 2012, but nothing really struck us. 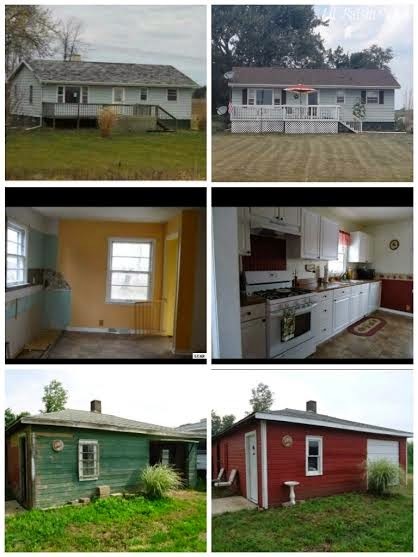 We were looking for something around 3-5 acres in a rural-ish setting, with a modest 3-4 bedroom home on it. Either the parcel was too small, or the house was too big. Too close to town, or too far away from Brian's employer. We'd pretty much given up for the time being, and were preparing for the holidays when my Mom forwarded me a foreclosed home listing a few days after Thanksgiving. It was in a town I had NEVER heard of, and had to Google it! A whole 2100 residents? I liked that idea! Close enough to a decent sized town for grocery shopping, yet far enough from town to not have neighbors right on top of us and 2 colleges nearby for Britt. The acreage was exactly the right size, the home itself was modestly sized, propane heated and had a private well (off grid features always a plus!). AND, the price was ridiculously low compared to some of the other homes we'd seen! AWESOME! But, why so low? From the lead photo I could tell it needed a new roof, and it was very dull looking, Not much curb appeal AT ALL, but knew that could be easily remedied, and a roof that size could be replaced fairly inexpensively. And then I started browsing the other photos... The people had literally taken the kitchen sink- not a stitch of plumbing to be found. They even had tried to pry the back splash tiling off the wall. Total disaster, kitchen completely stripped. Oddly enough, though, the fixtures in the bathroom all appeared to be new and in place! My hopes had pretty much sunk by that point, but the price was exceptionally right, so I went ahead and forwarded the ad to Brian, who's employer was only 35 minutes from the property. His first reaction was a resounding NO, but he liked the price, too. That evening he came by here after work, and immediately loved the location. He brought me out over that weekend, and we made an appointment to put in a bid within the week. Thankfully, we went ahead and offered what the bank was asking, for another person tried to put in a bid a few thousand less the next day! There were many ups and downs through-out the purchase process and at a couple points, it seemed like the deal might fall through. Honestly, it was a more stressful than cheerful time. The realtor and the branch bank were both unfamiliar with rehab loans, which caused a LOT of headache. We were pretty much on our own working out exactly what paperwork was needed to contract the builder to do the roof and kitchen remodel. When we finally closed the deal, it felt like 392478374 pounds had been lifted off our shoulders. But, there were still many trials to come! When the propane was reconnected and turned on, Britt kept insisting she smelled something funny near the kitchen, though she couldn't explain what it was. My parents stopped by and said the same thing. Come to find out, when the jerks tore the kitchen apart, the gas line leading to the stove was somehow punctured!!! Thank God I had quit smoking, and that we hadn't installed a stove yet, or this place could've been blown apart! After that, things just got better and better! 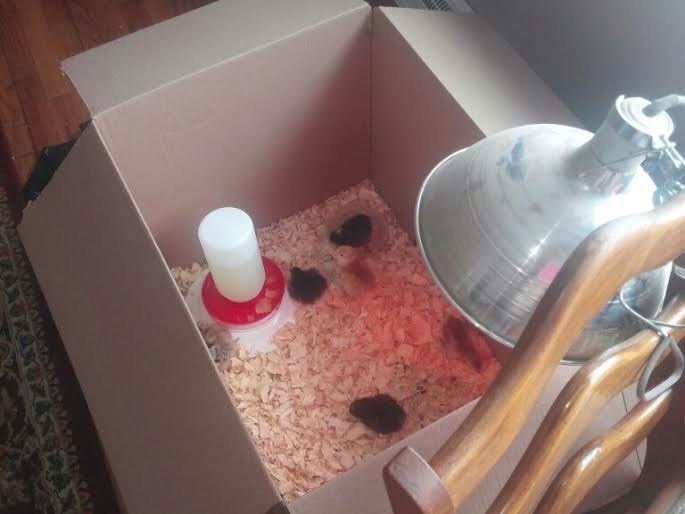 The week after we moved in, we picked up our first group of 6 chicks from Tractor Supply. You know them as Pecker, Dumpster, Nosy, Athena and Venus. 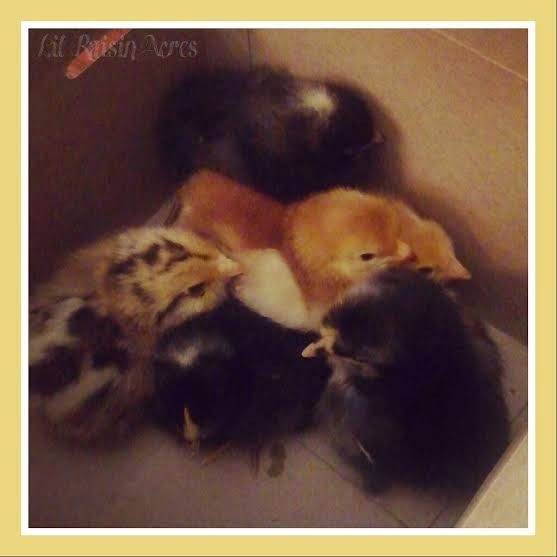 Sadly, we didn't notice that the 6th chick, a second leghorn, seemed to be ill til we got her home. We also realized it had a bum leg, probably a congenital defect. She died a couple days later. Our first taste of livestock reality down on the farm here... Since then, we've gotten 10 more chickens, but have lost 3 of them (Stormy just disappeared all together, Pepper choked on a feather, and Cookie was attacked by a hawk). By accident, we ended up with a rooster, which I swore I would never have due to the crowing... We've also gotten turkeys and guineas, too! Besides just chickens, we ended up with our late buddy Houdini AKA Deenis the goat when we were talking to folks living next door to the acreage my brother and his in-laws have their campers parked at. We were looking for a small goat, and ended up with a 200 lb whopper with an appetite for anything he wasn't supposed to be eating. The neighbors didn't want to send him to slaughter because he was just so friendly! We also picked up Baa Sheep, the shy ewe who's former owner was no longer able to care for her late last spring. We had an interesting time trying to shear her for the first time last spring. Little Doggie came to live with us last summer, too! She certainly keeps the chickens on their toes! After Deenis died last month, we got Opie and Daisy, our pygmy goats, to keep Baa company. They're very energetic! Our first year here, I started seeds on a mammoth scale, but came to realize that without a decent tiller of our own, we'd have to scale it down. Renting a walk behind rear tine for a single day once a year doesn't cut it for 1/8th or so acres! This year, however, after inheriting an ATV, it looks like we're going to be in business! We've been looking at pull behind disc harrows, and have already received our rather large seed order! At some point, a green house is in the works, as well as perhaps some raised beds for my herbs and leafy greens. Although we've done quite a few physical improvements, we're still lacking in curb appeal due to lacking landscaping. Not my strong suit, but we've been adding things each spring/summer. It is a little difficult when you have free ranging chickens who like to dig and scratch, but we're working on it! I feel like a cottage garden with wildflowers/perennials would be most suitable here. I'm not a huge fan of bushes. 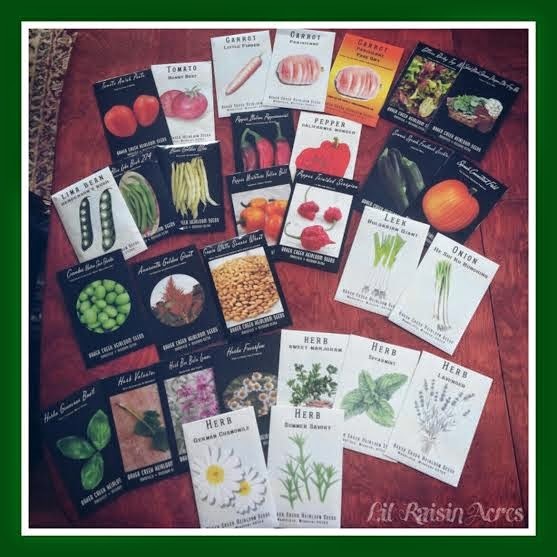 I've got several types of seeds I'm hoping will grow for me so I can get started on it! At some point, we'd like to completely tear down the Frankenstein and build a separate steel barn and larger coop out back and a new garage that actually fits 2 cars in it! But that is a LONG way off (you know, like when we win the lotto! LOL). I'll be happy if we can just properly tie in the roof and get the entire thing done in metal, as well as replace the rickety sliding doors! 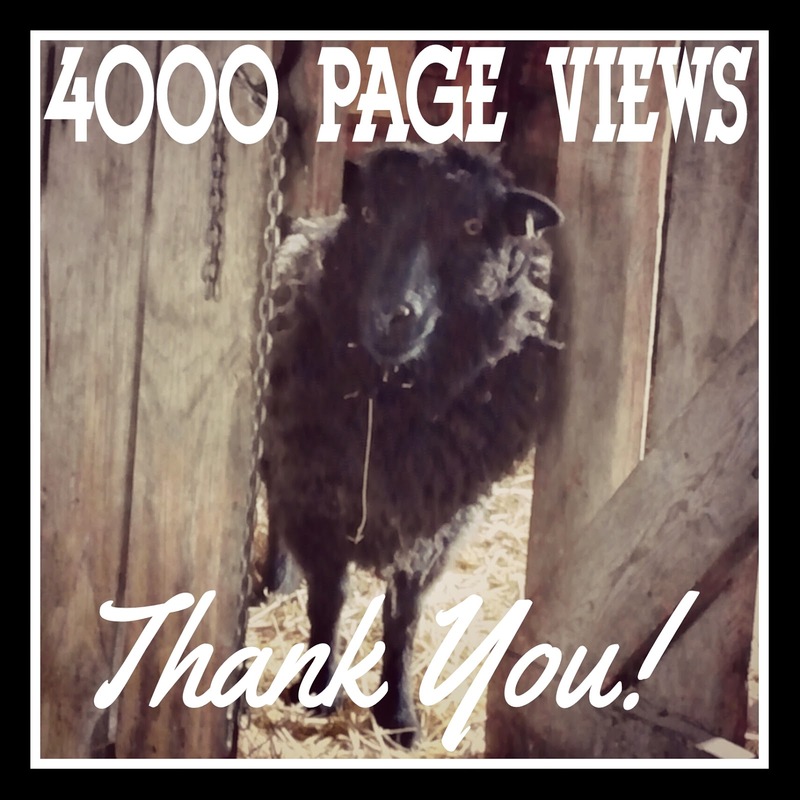 Actually, over 4100 now :) Thank you so much for taking time out of your day to peruse our blog! I hope you find the posts helpful! THANK YOU! Have You Purchased Your Seeds Yet? Back before I began starting my own seeds at home, I would walk into home improvement stores and big box department stores and roll my eyes at the seed displays prominently displayed before Valentine's Day. "How ridiculous! 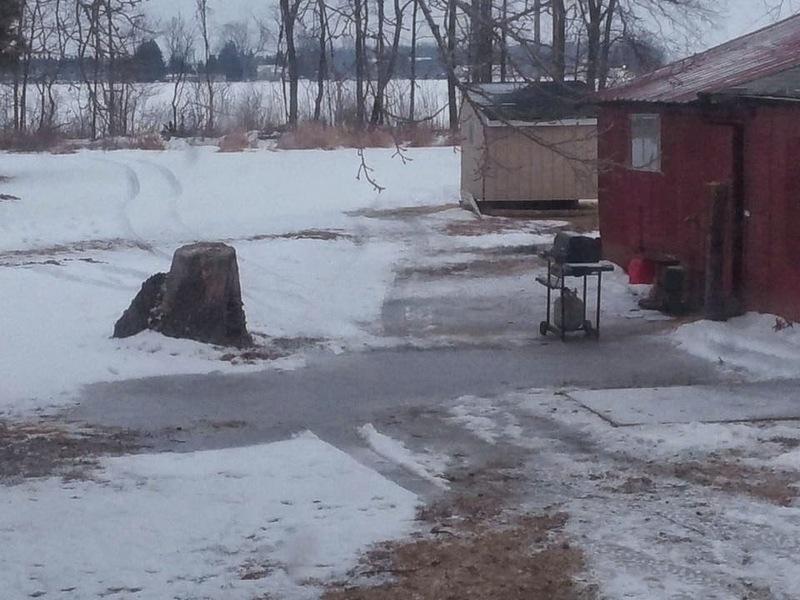 It won't be planting season for months!". Now, seed catalogs and displays are the highlight of the winter (well, besides Christmas)! 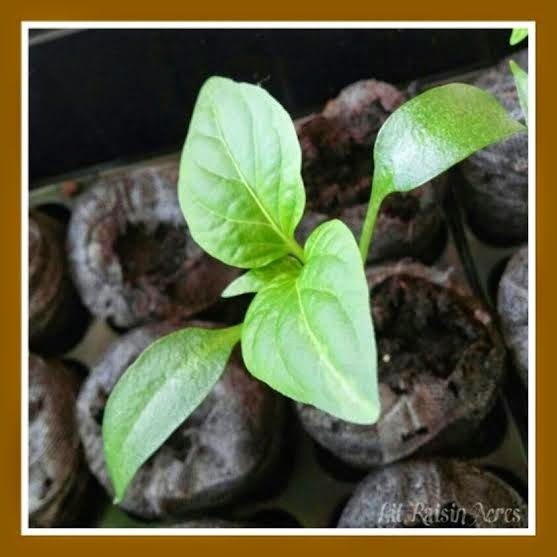 A California Wonder Sweet Pepper seedling. As a kid, my Dad and Grandparents always just purchased already started plants like tomatoes and peppers that couldn't be direct seeded in the garden at our local greenhouse. While it is honestly much more convenient for the average home gardener, it's significantly more expensive if you wish to grow more than maybe 6-8 plants. You're also very limited on available varieties. If we only grew what can be found at major outlets, we'd never know that there are orange, yellow, even black tomatoes! Another concern is that the starts found at big box stores have been treated with chemicals that harm beneficial insects and pollinators. Seeds can be expensive, depending upon where you decide to purchase and the rarity of seed, but there are low cost brands available. For example, Dollar Tree sells common varieties from like Contender Bush Beans and Little Wonder Peas for $.25 per pack, but the germination rates (how many seeds actually grow) are markedly lower compared to other brands of the same variety I've grown in the past. On the other hand, I paid $3.00 for one packet of 10 seeds of the rare "Hottest Pepper on the Planet" Trinidad Scorpion Pepper I ordered from Baker Creek Seeds. However, everything I have ever purchased from them has had excellent germination rates and grew into strong, healthy plants. Their common varieties run around $2.00/pack. Regardless, a $2.00 packet with 25 seeds is much less expensive than $3 for 4 plants! From personal experience, I HIGHLY recommend purchasing seed through the mail from a reliable source providing open-pollinated heirloom seed. This means that once you purchase that seed once, you can save seed from your own plants and never have to purchase that same one again! But that's another discussion for another time! Richter's Herbs - Specializes in medicinal and culinary herbs. Seeds and plant starts available. Many hard-to-find varieties, Great germination rates, but be mindful of your hardiness zone when purchasing perennials. The past several days have had daytime temps of just at or below zero when wind chill is considered. We're not having a real good time, and are hoping for some weather at least above freezing as soon as possible! 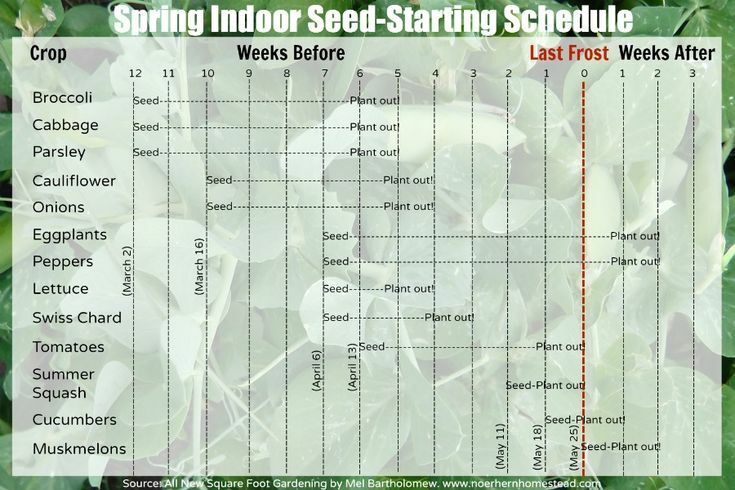 If we could hibernate til mid-March (seed starting! ), we would! Our outdoors spigot is frozen, so we're having to fill individual gallon jugs every few hours to refill frozen waterers and bowls. I try to usher all the birds into the barn every morning to make less work for myself, even carrying some of them! Brian installed a heat lamp in the garage, which is shining through a divider window into the goat/sheep pen. We've been over stuffing the coop with straw, but now have Pecker and Funky taking up residence in our only bathtub/shower. Leghorns like Pecker are not real cold hardy, and she's got some mild frostbite. Funky was found shivering in the coop, and was brought in- what a time to molt! Thankfully everyone else seems OK thus far, not enough room for 14 chickens in there! I honestly don't recall any long, drawn out cold snaps like this any other time in the past but this year and last. Sure, we had some deep snow here and there, or a few very cold days here and there, but just weeks at a time? Especially discouraging when your long time friend is getting ready start planting her veggie garden in Texas! I think everyone has a little touch of cabin fever over here, including the animals... I'm so ready for spring it's ridiculous! First, I FINALLY got around to ordering Mexican Sour Gherkins Cucumber. Pickled veggies are a staple in my every day diet, and I have been very curious as to how these might taste when pickled in Dad's Dilly Bean brine. We have never really had good luck with large carrots, so we thought perhaps some of the smaller rooted varieties might be something worth trying instead. I wanted Parisienne, a sort of radish sized and shaped variety, and Brian was eyeing the narrower Little Finger, so we went with both! We were also given a second packet of Parisienne as our free gift! Can never have too many carrots. Then, there are the grains, Golden Giant Amaranth and White Sonora Wheat. I am not sure exactly how they will fare in Zone 6a here, but I thought it was worth a shot. I'm really interested in grinding flour and making breads and tortillas. Brian insisted we order the world's hottest pepper, the Trinidad Scorpion Pepper. An old classmate of mine commented that they are "ridiculously hot". In the past we've grown Habaneros, which are great in chili when used sparingly. I guess, we'll have to see! I had mentioned maybe a week ago that I'd like to expand my herb garden and begin market selling at some point. Baker Creek has many herb seeds to choose from, although they don't specialize in them. I ordered 9 different varieties to add this year! At some point, I may put in an order to Richter's Herbs, who specialize in herb seeds and plants as well. I have a little research to do regarding the planting conditions of a few of them yet. I was honestly in a pretty grumpy, cabin feverish mood this afternoon, but as soon as I saw that envelope in my mailbox, it was all good LOL Are you planting anything new this year? Have any advice concerning these I mentioned? Comment below! You may order a FREE Baker Creek Seed catalog HERE. A simple, but flavorful take on Potato Soup which usually contains carrots and celery, or bacon, cheese and scallions. This is a great recipe for homesteaders! 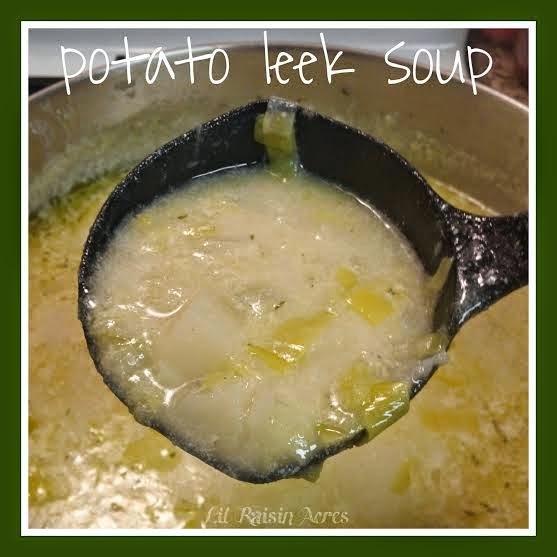 Potatoes and leeks are readily available in the winter, and very inexpensive. If you grow your own, potatoes and leeks are easily kept all winter long in a properly built root cellar in the basement. Leeks can even be mulched and overwintered outdoors right in the ground in climates with milder winters. Slice leeks up to about an inch above the white bulb portion, compost the tough dark green upper leaves. They have a tendency to get soil lodged between their leaves near the bulb, so be sure to thoroughly rinse! In a large pot, melt butter and add leeks, and a dash of salt and pepper. Saute leeks in butter for about 15 minutes, or until they become tender. Add broth and potatoes to pot, bring to a boil. Season to taste. Add milk and simmer for about 45 minutes, or until potatoes are tender. Use a potato masher to mash some of the potatoes for a smoother consistency, if desired. Makes about 6 meal sized portions. Here is our 2015 Planting Season seed order for Baker Creek! I will be ordering additional herbs from Richter's in a few weeks. Do you sell...? It's a question I've been asked quite a bit in the past few months or so. I've been asked about fresh herbs, pickled goods, infused oils, flavored vinegar... The answer is - NOT YET. We'd really like to get into market selling, and we have talked with the managers of our local markets about the process for future reference. Thus far, we've only been selling a few dozen excess eggs here and there to friends and coworkers. There is a lot more to LEGALLY selling many prepared food stuffs than one would think, even though Michigan does have a Cottage Industry Law that allows a homemaker to sell specific goods up to $20,000 in profit per year without being inspected/licensed. Thankfully, we can legally sell fresh and dried herbs, and fresh and dehydrated fruit and vegetables if we choose. Baked goods like breads and cookies are also permissible. However, sadly, I would need to rent a licensed kitchen (which is fairly expensive) to legally sell any type of meat jerky like our "Black Pepper and Garlic Venison Jerky"and "Salt and Pepper Stew Chunks" for camp meals, or pickled items like "Dad's Dilly Beans" and "Carrie's Stinky Cauliflower". What's interesting is, though, that flavored vinegar and home canned jams and jellies ARE something I can sell without renting a kitchen. By now you're probably as confused as I am, right? Disregarding the legal aspects, there is the issue of expanding our garden, both size wise and plant variety wise. In the past 2 seasons, we have not produced enough herbs, vegetables or fruit to put away for ourselves AND sell at the market. We're hoping we will be able to get a hold of a disc for our ATV relatively soon, which will enable us to turn over the entire 1/4-ish acre fenced former horse pasture into garden. Our little Mantis tiller just doesn't cut it for large vegetable gardens! Admittedly, it's a little scary to take that next step into actually becoming a full-time seller. It will be a big commitment, and I will be soley responsible for the success or failure of the venture. That's quite a responsibility, especially since so much time and money will be invested into it. I don't expect to be ready for the 2015 season, but 2016 is a real possibility if I can get the ducks in a row with the garden plot this summer. I guess we shall see! Do you sell homemade goods at a market or online? What do you sell? Do you have any advice for me and others? Please comment below! Bananas are one of the least expensive fruits available at the grocery store, and are a great source of potassium. It's extremely simple to dry your own! 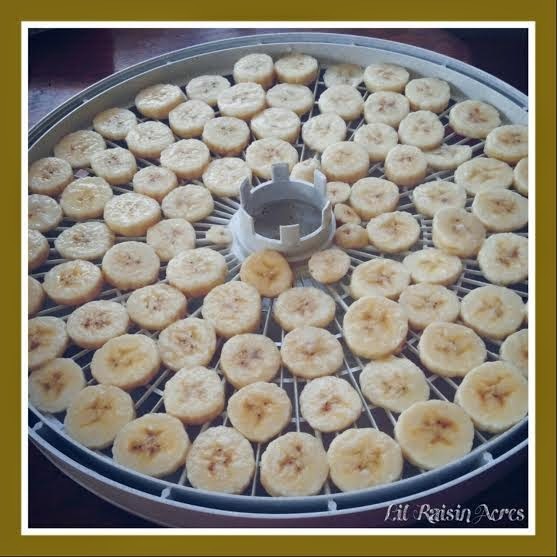 Dehydrating bananas is extremely simple. Just peel, slice into 1/4" slices, dip the slices in lemon juice to prevent blackening and dehydrate on 135 degrees for about 8-10 hours. They will slightly darken in color, and will remain just a tad pliable. It's a good idea to remove them from the trays while they are still warm, as they may stick! Store your dehydrated banana chips in a clean glass jar with an airtight lid in a cool, dark, dry place for long term storage. Mix banana chips with other dried fruits, seeds, and nuts for a tasty homemade trail mix for your next outdoors adventure! This one "pot" meal is one of the favorites around Lil Raisin Acres! Put it on in the morning, go about your chores, and a hearty dinner awaits you in the evening! 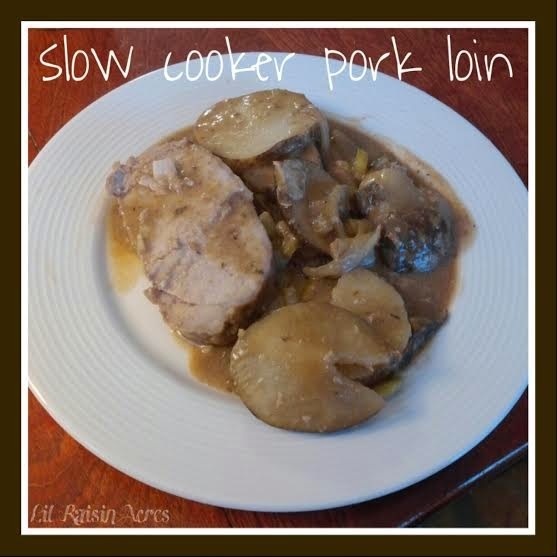 Layer potatoes, celery, onions, garlic and mushrooms in the bottom of the slow cooker and place loin on top. Pour condensed soup, dry gravy mix, and spices atop of the loin and vegetables. Cover and cook on LOW for 6-8 hours, until potatoes are tender and loin slices easily. Makes about 4 servings. 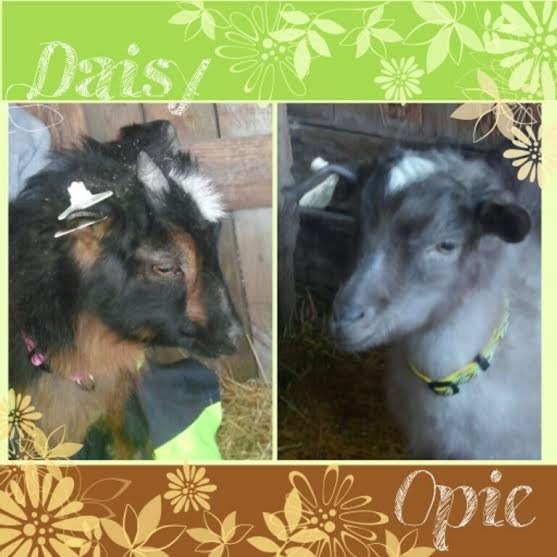 We'd like to welcome our newest residents Daisy and Opie to Lil Raisin Acres! They are 8 mos and 7 mos old respectively Pygmy/Fainting crosses. We couldn't decide which of these cuties we wanted, so we took both! We picked them up Saturday afternoon before the big blizzard hit! They still need quite a bit of human socialization, but are warming up quite nicely to us. Daisy will sit quietly on our laps, while Opie is a little more independent and curious, and would rather be exploring. They are about as big as they are going to get, other than perhaps gaining a little more weight we were told. They are about 1/4 the size our boy Deenis was! Anyone in the Hillsdale Co. MI area looking for small companion goats, contact R and J Farms. Jessica is extremely knowledgeable and honest, and the pricing is very reasonable. Lots of adorable, healthy looking little fellas to choose from! You'll be seeing a lot more of these little guys in the future! Onions and garlic are in just about everything- soups, sauces, meat marinades and rubs... Dehydrating your own at home is a simple, money saving process! Onions and garlic are dehydrated much in the same way as mushrooms - there is no need to blanch them before drying. You will process the raw produce depending on what end product you'd like- Whole? Minced? Powdered? I personally prefer simply slicing them, and drying whole for versatility. Be warned that some people find the scent of drying onion and garlic overpowering! (Personally, I like it!) You may choose to set up in a room with the door shut, or in a garage on warmer days. 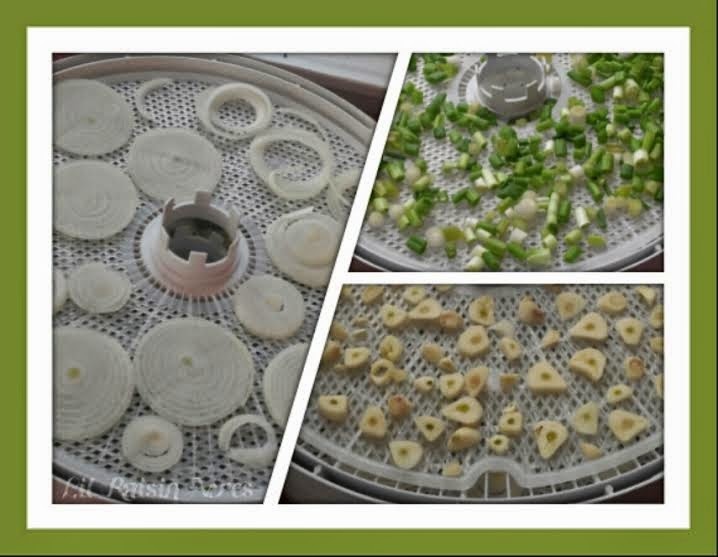 Set dehydrator on 135 degree vegetable setting for bulb onions and garlic. Slices: Slice onion/garlic about 1/8" thick. No need to separate the individual rings. 8-10 hours process time (save time on prep, but longer time in the dehydrator). Minced: You may either chop the raw onion before placing in the dehydrator (a food processor works well), or dehydrate as above, then crush into smaller pieces as needed. 6-8 hours process time. Powdered: Use a rocket blender to grind dried product into powder. Be aware that onion will not re-hydrate to original texture. I do not recommend using re-hydrated onion slices on sandwiches and burgers! Set dehydrator on the 95 degree herb setting for bunching onions and chives. Slice into 1/4" long pieces. Process for about 6-8 hours. Store all your dehydrated produce in clean glass jars with an airtight lid. For a longer shelf life, you may add an oxygen absorber to the jars, or use a food saver with jar attachment! *For large batch onion processing, I recommend using a mandoline slicer and/or food processor. We use a Norpro Mandoline Slicer and a Hamilton Beach 8-Cup Food Processor .